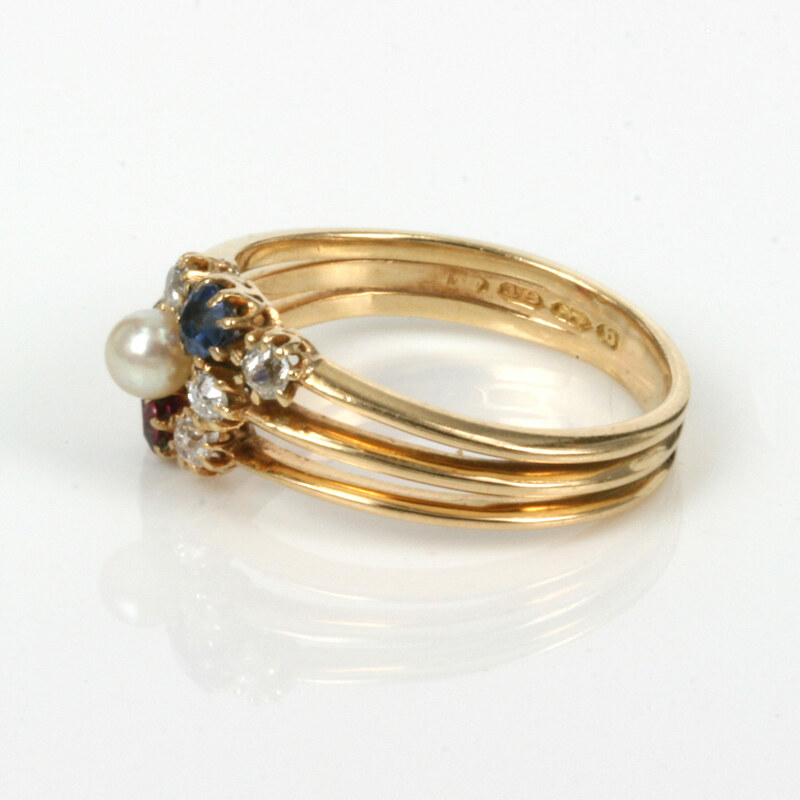 Antique sapphire, ruby, pearl & diamond ring made in 1882. Product code: 2398 Categories: Sold Items, Sold Rings. Antique rings so often have so much charm and character about them in not only the cuts of the gemstones, or the way they have been made but also in such things such as the design of them, and this is a marvelous example of a very unique and special antique multi-stone ring from the Victorian era. 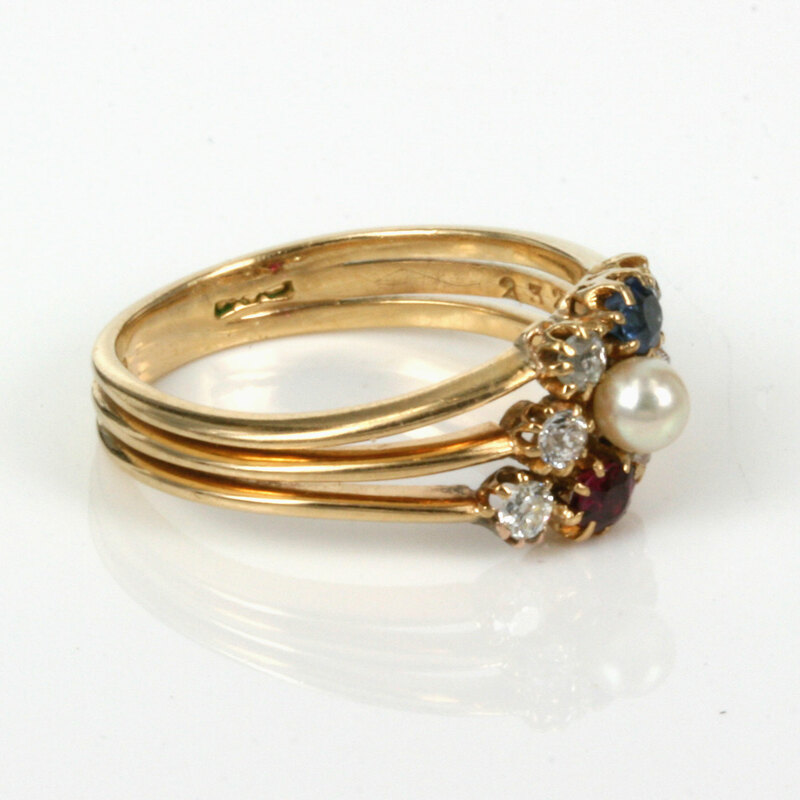 Hand made in 18ct gold in Birmingham in 1882, this delightful and very special antique ring is set on a triple band set with 6 diamonds and a pearl, ruby and sapphire. The way the gemstones have been set as a slight angle makes this ring look amazing on the finger and also gives it the ability to be worn with other antique rings as well as modern contemporary rings and still manage to blend seamlessly between the two. The six antique European cut diamonds total 0.36 carats, and both the ruby and sapphire 0.12 carats each. At its widest part in the centre, the ring measures 9.4mm and from left to right from the furthest diamond on each side it measures 12.5mm across. This is a very elegant antique ring that looks divine on the finger and sits nice and flat on the finger and will look marvelous whenever it is worn on any finger of the hand.